We were lucky to find a parking spot in front of this imposing old building and even luckier to find a seat inside. The Francis Thompson Room was packed and more chairs were being carried in right up to the gig’s start time. It is truly heartening to see so many people on a Friday, forsaking the bars, eateries (barbecues, even, on such a glorious evening!) or comforts of home to listen to live jazz. They arrived expectant, they left buzzing after a piano-themed feast served up by musical master chefs, Edis, Morgan and Champion! 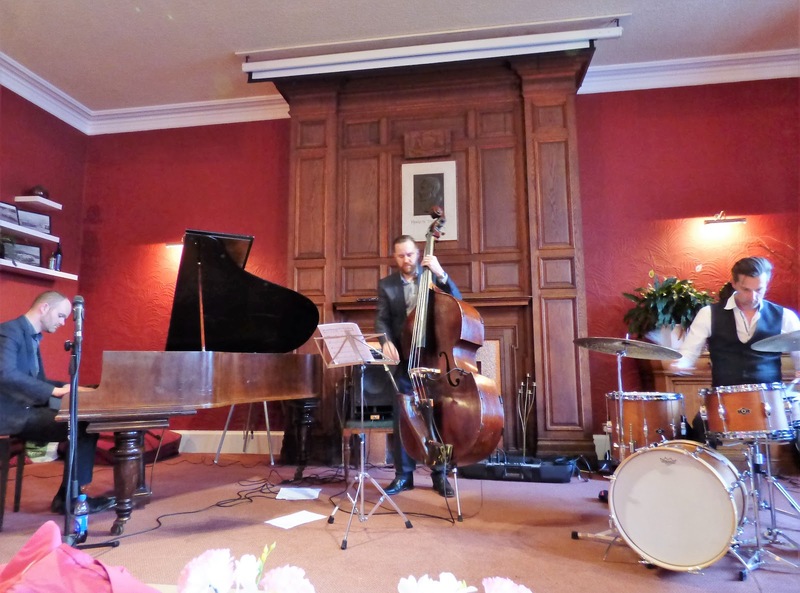 The trio, then with Adam Sinclair on drums, had given a similar master-class in Fenham last month (see review by Russell). As then, they opened with a personal favourite, It’s Only a Paper Moon, with solos and fours giving all three musicians the chance to introduce themselves to the audience. Nat King Cole’s influence on other pianists was the link to Moten Swing, here performed in a manner which would probably have raised approving smiles from Messrs. Thigpen, Brown and Peterson. Another disciple was Bill Evans who, in turn, is a massive influence on tonight’s pianist – thus it is that music evolves. Like Someone in Love opened with an almost classical piano intro and included more fours, later, with Edis singling out tonight’s drummer, Russ Morgan, for additional applause at the end. 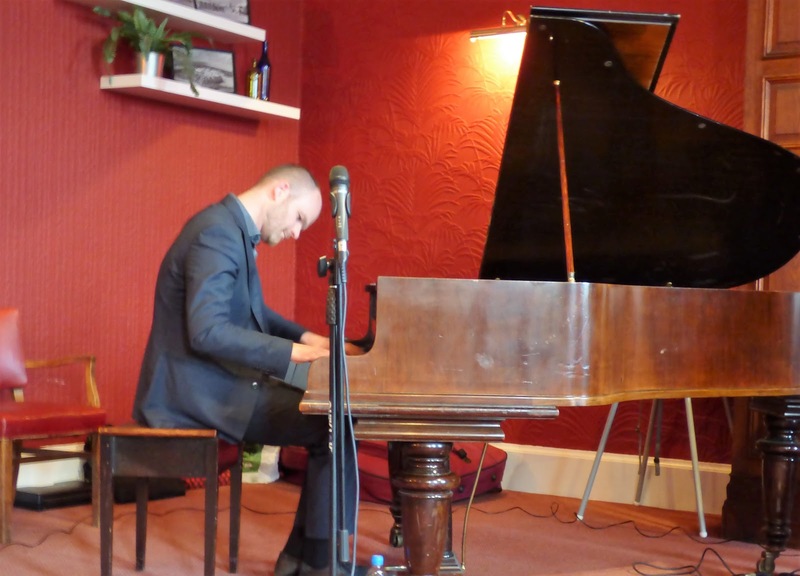 Snakes and Ladders and Lucky Eleven, two Edis originals, followed – the justification of their inclusion in the “history of jazz piano” being as inventive as some of the composer’s own solos on the night – but great tunes both. Lucky Eleven is a beautifully melodic, reflective ballad while Snakes and Ladders is either “a philosophical narrative about life” or “a tune which goes up and down” according to the listener’s preference! Timeout for the interval was signalled by Unsquare Dance, appropriately from Brubeck’s 1959 album, Time Out. Infectious 7/8 time, rhythmic clapping and drumming and dexterous piano-work make this a crowd-pleaser but, as Russell commented after the Fenham gig, it’s really Andy Champion’s bass which holds the pyrotechnics together. It certainly pleased this crowd who seemed almost to be expecting an encore even though it was only the end of the first set! That elation was quickly re-established by the up-tempo Edis original, Whiskers with big applause for the bass solo and for great brush-work (“whisker-work” maybe?). There was amazing piano on Lullaby of Birdland with a sustained two-handed tremolo (trill?) moving almost all the way up the keyboard. The bass solo and cheeky ending were also noteworthy. More Evans followed with the “complex harmonies” of Very Early, a tune Edis uses as an exemplar with his degree students. Talking of names to conjure with, this is one I have to google every time: Ba-Lue Bolivar Ba-Lues-Are – as quirky and as brilliant as the man himself! In between intricate runs and piano tricks, some of Edis’ hammered, finger-jabbing notes reminded me of the person living below Monk’s apartment who complained about the man upstairs demolishing pianos! Champion, not to be outdone, elicited whoops and cheers for his solo while Russ Morgan, starting with brushes, then hands (and elbows!?? ), then sticks and loadsa bass-drum, whipped up a storm! How, as an encore, do you follow that? With a kamikaze-paced Edis original, Lines, that’s how! As I said earlier, the audience (big enough almost to call it a crowd!) were buzzing and, had the gig gone on for two days, as Edis jokingly threatened at the start, no-one would have left.